« May your Merry be Very! My precious stamping buddy, Laurel, reminded me today that I’d not posted a copy of the wedding invitation that I made my son Tony and his future wife, Amber. Tony and Ams are both ‘mad musicians’ so the wedding was always going to feature music. Ams favourite flowers are frangipani so they also got a little look in. (try cutting out 180 of those little suckers!) 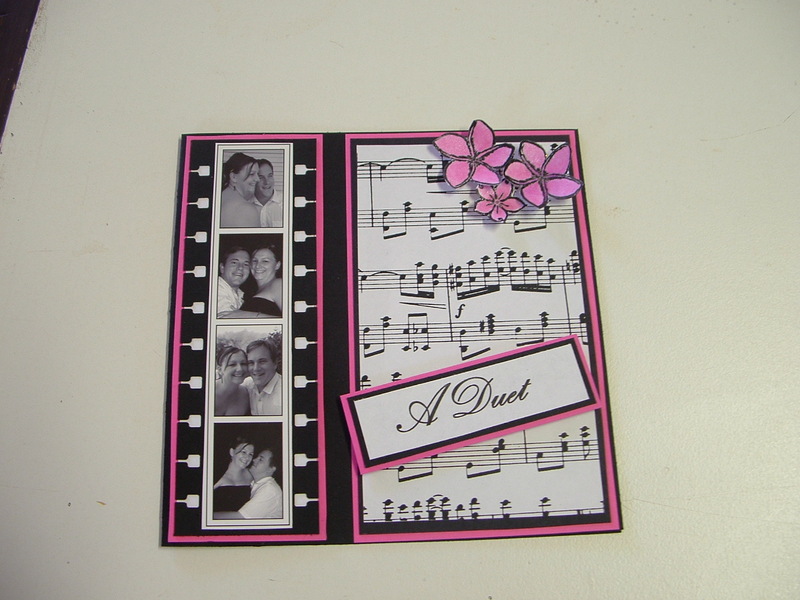 I used the spiral punch to create the faux film strip. Don’t try counting them. There are 15! Yes. 15 pieces/layers of paper on each invitation. This was however a labour of love. I enjoyed making them for the happy couple and hearing how they were ‘just what they wanted’. Makes the effort all worthwhile. Thanks Kerri! and thanks for visiting me!! !